Our entire menu is available for takeout all day. Call us with your order or use our Square Marketplace online store. 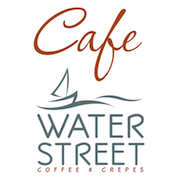 Visit Cafe Water Street at Square Marketplace to order online. Our online store allows you customize your drinks, build your crepes and pay online. Orders usually ready in 15 minutes. © 2017 Cafe Water Street. All rights reserved.